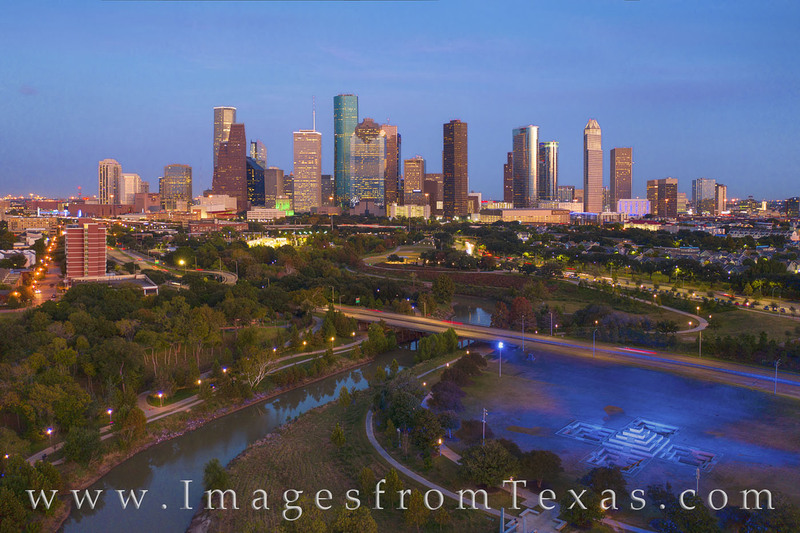 Photographed using a drone, this aerial image of the Houston skyline from Buffalo Bayou shows the largest city in Texas shining on a cool November evening. The purple-blue glow in the bottom right is the Houston Police Officers Memorial. It was built in 1990 in the shape of a Greek Cross. The tallest highrise in downtown is the JP Morgan Chase Tower at 1,002 feet. In its shadow are other architecturally interesting bulidings, including the Wells Fargo Bank Plaza and the Williams Tower. In the foreground, Buffalo Bayou rests tranquilly as evening falls. This entire area was underwater after Hurricane Harvey battered the Texas coast in 2017, but has recovered to provide a great outdoor experience close to the heart of downtown. Photo © copyright by Rob Greebon.